Barnhardt, R. (2005). Culture, Community and Place in Alaska Native Education. Democracy and Education, 16(2), pg. ? (forthcoming). Education in one form or another has been an essential ingredient contributing to the cultural and physical survival of the Indigenous peoples of Alaska for millennia. The accumulated knowledge systems, world views and ways of knowing derived from first-hand engagement with an oftentimes harsh and inscrutable arctic environment have been integrated into the fabric of the Indigenous societies and passed on seamlessly from one generation to the next in the course of everyday life. Education in its traditional forms continues to be an integral part of Alaska Native cultures and communities. With the arrival of the early explorers, traders, missionaries and teachers, a collision of world views occurred, including the introduction of competing ways of learning about and understanding the world in which people lived, thus disrupting the balance in the traditional system. Gradually, a new way of educating was introduced in the form of –schooling,” operating on the assumption that the introduction of western ways through western institutions would transform Native people into citizens of the –modern” world. However, after 100 years this –new” system has been found wanting on the river banks and ocean shores that Alaska Native people call home, often marginalizing traditional practices and providing for neither the cultural nor the academic well-being of many of the Native students entrusted to its care. As a result of the many years of continued frustration and broken promises at the hands of outside educational experts, Native people themselves are now asserting their own ideas for transforming schooling into a more culturally adaptive form of education, and they are finding ways to improve the quality of education for all students in the process. The remainder of this article will describe how schools throughout Alaska are being refocused by bringing together the deep traditional knowledge of Alaska Native people with the Western-based constructs, principles and theories imbedded in conventional curricula. The long-standing democratic principle of local control of education is being brought to bear on schools in rural Alaska through the bottom-up educational reform strategy of the Alaska Rural Systemic Initiative, while at the same time Native communities are grappling with the top-down pressures of current federal mandates. The Alaska Rural Systemic Initiative (AKRSI) was established in 1994 under the auspices of the Alaska Federation of Natives, which has served as the institutional home base and support structure for the AKRSI in cooperation with the University of Alaska, with funding from the National Science Foundation. The purpose of the Alaska Rural Systemic Initiative has been to implement a set of initiatives that systematically document the Indigenous knowledge systems of Alaska Native people and develop pedagogical practices that appropriately integrate Indigenous knowledge and ways of knowing into all aspects of the education system. In practical terms, the most important intended outcome is an increased recognition of the complementary nature of Native and western knowledge, so both can be effectively utilized as a foundation for the school curriculum and integrated into a more comprehensive approach to education that is grounded in the existing cultural and physical environment in which students live. The AKRSI initiatives themselves are implemented on a rotational cycle organized in reference to the major cultural regions that make up Alaska, so that the educational components are tailored to fit the particular cultural context in which they are situated. The following map illustrates the geographic spread of the various Alaska Native cultural groups, as well as the school districts in each region that have been participating in the initiatives. 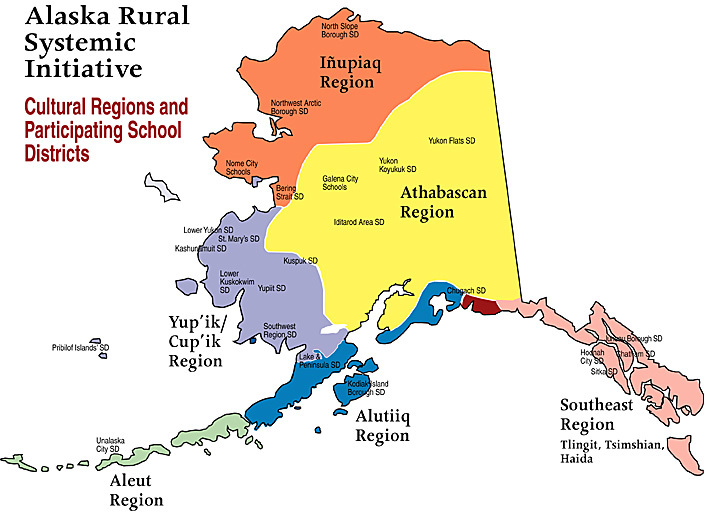 The central focus of the AKRSI reform strategy is the fostering of connectivity and complementarity between two functionally interdependent but largely disconnected complex systemsãthe Indigenous knowledge systems rooted in the Native cultures that inhabit rural Alaska, and the formal education systems that have been imported to serve the educational needs of rural Native communities. Within each of these evolving systems is a rich body of complementary knowledge and skills that, if properly explicated and leveraged, can serve to strengthen the quality of educational experiences for students throughout rural Alaska (Boyer, 2005). The 16 distinct Indigenous cultural and language systems that continue to survive in rural communities throughout Alaska have a rich cultural history that still governs much of everyday life in those communities. For over six generations, however, Alaska Native people have been experiencing recurring negative feedback in their relationships with the external systems that have been brought to bear on them, the consequences of which have been extensive marginalization of their knowledge systems and continuing dissolution of their cultural integrity. Though diminished and often in the background, much of the Native knowledge systems, ways of knowing and world views remain intact and in practice, and there is a growing appreciation of the contributions that Indigenous knowledge can make to our contemporary understanding in areas such as medicine, resource management, meteorology, biology, and in basic human behavior and educational practices. Through long observation they have become specialists in understanding the interconnectedness and holism of all things in the universe (Kawagley, 1995; Barnhardt and Kawagley, 1999; Barnhardt and Kawagley, 2005). Among the qualities that are often identified as inherent strengths of Indigenous knowledge systems are those that have also been identified as focal constructs in the study of the dynamics of complex adaptive systems. These are qualities that focus on the processes of interaction between the parts of a system, rather than the parts in isolation, and it is to those interactive processes that the AKRSI educational reform strategy has been directed. In so doing, however, attention has extended beyond the relationships of the parts within an Indigenous knowledge system and taken into account the relationships between the system as a whole and the other external systems with which it interacts, the most critical and pervasive being the formal education systems which now impact the lives of every Native child, family and community in Alaska. Despite the structural and political reforms that took place in the 70ês and 80ês, rural schools have continued to produce a dismal performance record by most any measure, and Native communities continue to experience significant social, cultural and educational dislocations, with most indicators placing communities and schools in rural Alaska at the bottom of the scale nationally. While there has been some limited representation of local cultural elements in the schools (e.g., basket making, sled building, songs and dances), it has been at a fairly superficial level with only token consideration given to the significance of those elements as integral parts of a larger complex adaptive cultural system that continues to imbue peoples lives with purpose and meaning outside the school setting. Though there is some minimum level of interaction between the two systems, functionally they have remained worlds apart, with the professional staff overwhelmingly non-Native (95% statewide) and with a turnover rate averaging 30-40% annually. In May, 1994 the Alaska Natives Commission, a federal/state task force that had been established two years earlier to conduct a comprehensive review of programs and policies impacting Native people, released a report articulating the need for all future efforts addressing Alaska Native issues to be initiated and implemented from within the Native community. The long history of failure of external efforts to manage the lives and needs of Native people made it clear that outside interventions were not the solution to the problems, and that Native communities themselves would have to shoulder a major share of the responsibility for carving out a new future. At the same time, existing government policies and programs would need to relinquish control and provide latitude and support for Native people to address the issues in their own way, including the opportunity to learn from their mistakes. It is this two-pronged approach that is at the heart of the AKRSI educational reform strategyãNative community initiative coupled with a supportive, adaptive, collaborative education system. One of the most significant initiatives to come from the Native community was the adoption of a set of –cultural standards” that were developed by Alaska Native educators and Elders to provide explicit guidelines for how students, teachers, curriculum, schools and communities could integrate the local culture and environment into the formal education process so that students would be able to achieve cultural well-being as a result of their schooling experience (http://ankn.uaf.edu/publications/standards.html). The focus of these cultural standards has been on shifting the emphasis in education from teaching about culture to teaching through the local culture as a foundation for all learning, including the usual subject matter. Each of the AKRSI initiatives serves to guide the streams toward a mutually compatible and complementary relationship. 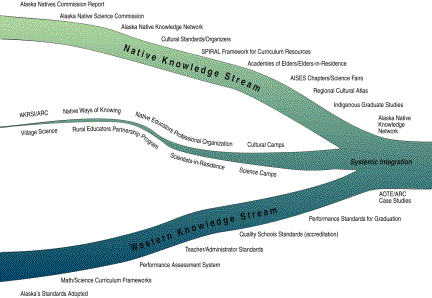 For example, the Alaska Native Knowledge Network assembles and provides easy access to curriculum resources that support the work underway on behalf of both the Indigenous knowledge system and the formal education system (http://www.ankn.uaf.edu). In addition, the ANKN newsletter, Sharing Our Pathways, provides an avenue for on-going communication between all elements of the constituent systems. Concurrently, the AKRSI has been collaborating with the Alaska Department of Education and school districts in bringing Native educators from the margins to the center of educational decision making to shape policy development in ways that take into consideration the cultural context in which students acquire and demonstrate their knowledge, using the cultural standards as a guide. Together, these initiatives constitute the core strategy of the Alaska Rural Systemic Initiative and are intended to generate a strengthened complex adaptive system of education for rural Alaska that can effectively integrate the strengths of the two constituent emergent systems. The exact form this integrated system will take remains to be seen as its properties emerge from the work that is underway. Accepting the open-endedness and unpredictability associated with such a change process, and relying on the emergent properties associated with the adage, –think globally, act locally,” we are confident that we will know where we are going when we get there. Adopting the emphasis that these initiatives bring to engaging students in the study of culture, community and place, schools across the state have been engaged in common endeavors that unite them, at the same time that they are concentrating on particular initiatives in ways that are especially adapted to the Indigenous knowledge base in their respective cultural region. Each set of initiatives and themes have built on each other from year to year and region to region through a series of statewide events that bring participants together from across the regions. These include working groups around various curriculum themes, Academies of Elders, statewide conferences, the AKRSI staff meetings and the Alaska Native Knowledge Network. Following is a brief description of some of the key AKRSI-sponsored initiatives to illustrate the kind of activities that have been implemented, as they relate to the overall educational reform strategy outlined above. Alaska Native Knowledge Network - A bi-monthly newsletter, web site and a culturally-based curriculum resources database have been established to disseminate the information and materials that have been developed and accumulated throughout Alaska (http://www.ankn.uaf.edu). S.P.I.R.A.L. Curriculum Framework - The ANKN curriculum clearinghouse has been identifying and cataloging curriculum resources applicable to teaching activities revolving around 12 broad cultural themes organized on a chart that provides a –Spiral Pathway for Integrating Rural Alaska Learning.” The themes that make up the S.P.I.R.A.L. framework are family, language/communication, cultural expression, tribe/community, health/wellness, living in place, outdoor survival, subsistence, ANCSA, applied technology, energy/ecology, and exploring horizons. These themes have also been used to formulate whole new curriculum frameworks that have been implemented in several schools and districts. The curriculum resources associated with each of these themes can be accessed through the ANKN web site. Native Ways of Knowing - Each cultural region has been engaged in an effort to distill core teaching/learning processes from the traditional forms of cultural transmission and to develop pedagogical practices in the schools that incorporate these processes (e.g., learning by doing/experiential learning, guided practice, detailed observation, intuitive analysis, cooperative/group learning, listening skills and trial and error). Academies of Elders - Native educators have been meeting with Native Elders around a local theme and a deliberative process through which the Elders share their traditional knowledge and the Native educators seek ways to apply that knowledge to teaching various components of the curriculum. The teachers then field test the curriculum ideas they have developed, bring that experience back to the Elders for verification, and then prepare a final set of curriculum units that are pulled together and shared with other educators. Village Science Curriculum Applications - Several volumes of village oriented science and math curriculum resources, including a –Handbook for Culturally Responsive Science Curriculum” (Stephens, 2000), have been developed in collaboration with rural teachers for use in schools throughout Alaska. They serve as a supplement to existing curriculum materials to provide teachers with ideas on how to relate the teaching of basic science and math concepts to the surrounding environment. In August, 2005, the Alaska Rural Systemic Initiative completed its final year with a full complement of rural school reform initiatives in place stimulating a reconstruction of the role and substance of schooling in rural Alaska. Students are now spending more time out in the community with Elders, parents and local experts. School curricula are reflecting the knowledge, values and practices that have been a traditional part of life in the local communities. Teachers are incorporating a more place-based pedagogy that is engaging students in studies associated with the surrounding physical and cultural environment. The Alaska Standards for Culturally Responsive Schools developed by Alaska Native educators have been adopted by the State Board of Education side-by-side with the state subject area standards and have become a part of the lexicon of education in schools throughout Alaska. The beneficial academic effects of putting students in touch with their own physical environment and cultural traditions through guided experiences have not gone unnoticed by school districts and other Native organizations around the state. One AKRSI school district has urged all of its schools to start the school year with a minimum of one week in a camp setting, combining cultural and academic learning with parents, Elders and teachers all serving in instructional roles. One school in the district has built in to their program a series of camp experiences for the middle school students, with a well-crafted curriculum addressing the state content standards as well as the cultural standards. Given the accountability demands of No Child Left Behind, a central question throughout all these educational innovations has been, what impact do they have on student academic achievement. With the advent of the state standards-based Benchmark tests and the High School Graduation Qualifying Exam in 2000, we now have four years of data on student performance in the 8th and 10th grade math exams, from which we can make comparisons between AKRSI-affiliated schools and non-AKRSI schools for those two grade levels (AKRSI, 2004). Following are two graphs showing the percentage of students performing at the –advanced” or –proficient” levels on those exams. 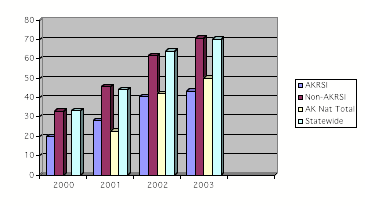 The most notable features of these data are the significant increases in AKRSI student performance for both grade levels each year between 2000 and 2003. 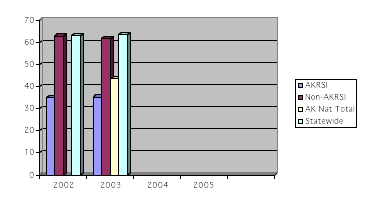 However, while the 8th grade AKRSI students showed significant progress in closing the achievement gap with their non-AKRSI counterparts from 20 to 17 percentage points, the 10th grade students in both groups showed a substantial gain from 2000 to 2003, leaving the achievement gap largely intact at that grade level. In addition to the state benchmark data, we also have norm-referenced test results for 9th grade students who have been taking the Terra Nova/CAT-6 since 2002. Though the differentials for each group between 2002 and 2003 remain small, the AKRSI students do show a slight increase in performance, while the non-AKRSI students reflect a small decrease in their performance over the two years. The consistent improvement in academic performance of students in AKRSI-affiliated schools over each of the past four years leads us to conclude that the cumulative effect of utilizing the Alaska Standards for Culturally Responsive Schools to increase the connections between what students experience in school and what they experience outside school appears to have a significant impact on their academic performance. The initiatives outlined above have demonstrated the viability of introducing strategically placed innovations that can serve as –catalysts” around which a new, self-organizing, integrated educational system can emerge which shows signs of producing the quality of learning opportunity that has eluded schools in Native communities for over a century. The substantial realignments that are already evident in the increased interest and involvement of Native people in education in rural communities throughout Alaska point to the efficacy of tapping into the cultural strengths of local communities in shaping reform in educational systems. We are mindful of the responsibilities associated with taking on long-standing, intractable problems that have plagued schools in Indigenous settings throughout the world for most of the past century, and we have made an effort to be cautious about raising community expectations beyond what we can realistically expect to accomplish. Our experience over the past ten years has been such however, that we are confident in the route we chose to initiate substantive reform in rural schools serving Alaskaês Native communities, and while we have encountered plenty of problems and challenges along the way, we have been able to capitalize on a broadly supportive climate to implement changes that have benefited not only rural schools serving Native students, but have been instructive for all schools and students. We intend to continue to explore these ideas and find ways to strengthen the connection between school and community in the educational systems serving all segments of our society. 2004 Annual Report. Fairbanks: Alaska Native Knowledge Network (http://ankn.uaf.edu/arsi.html), University of Alaska Fairbanks. 2005 Alaska: Rebuilding Native Knowledge. In Building Community: Reforming Math and Science Education in Rural Schools. Paul Boyer. Washington, D.C.: National Science Foundation. 1995 A Yupiaq World View: A Pathway to Ecology and Spirit. Prospect Heights, IL: Waveland Press. 1991 Yuuyaraq: The Way of the Human Being. Fairbanks: Center for Cross-Cultural Studies, University of Alaska Fairbanks. Stephens, Sidney 2000 Handbook for Culturally Responsive Science Curriculum. Fairbanks: Alaska Native Knowledge Network(http://ankn.uaf.edu/handbook/), University of Alaska Fairbanks.